Immediately after crossing the Arlington Memorial Bridge, I came across one of the most recognisable monuments anywhere in the world, the Lincoln Memorial. 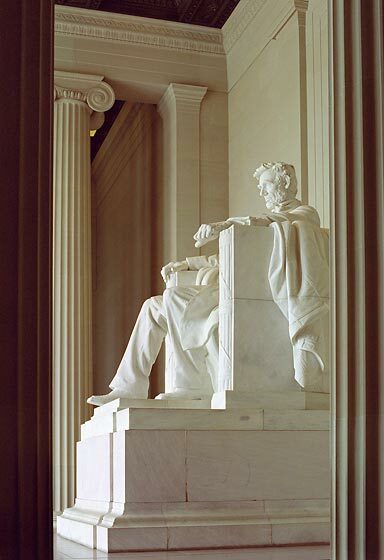 The Lincoln Memorial was designed by Henry Bacon, and is clearly inspired by the Parthenon in Athens. In 1889 Henry Bacon had won the Rotch Travelling Scholarship, which enabled him to study architecture in Italy and Greece. This background has obviously contributed to his design, which as a symbol of democracy draws heavily on the concept of ancient Greece as the birthplace of the democratic ideal. The building was commenced in 1914 and completed in the wake of World War I. At the time its idealised white marble columns and sheer size might have been seen to be a symbol of the triumph of American democracy over the dark forces threatening the world at the start of the twentieth century. It's design is certainly more reflective of the times of its construction than those of the man it commemorates. 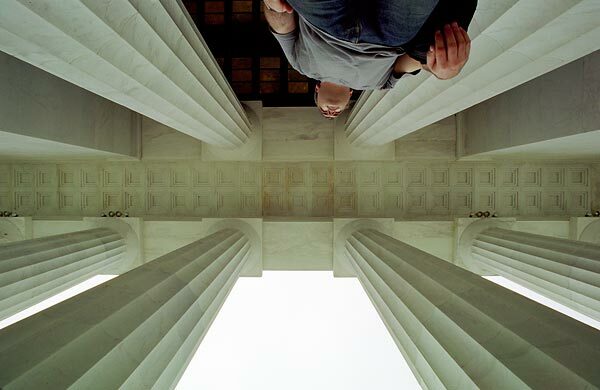 The design includes 36 huge Doric columns (one for each state at the time of Lincoln's death), around a room in which sits a 19 foot high statue of Abraham Lincoln. The statue was carved by Daniel Chester French and is estimated to weigh 120 tons. On the wall inside the building is the transcript of the Gettysburg Address, one of the most famous speeches of all time, and one which firmly enshrined the values of equality and freedom in the American psyche. The speech was given on November 19, 1863 at the occasion of the commemoration of the National Cemetery at Gettysburg, site of the most influential and famous battle of the Civil War. After a two hour speech from Edward Everett, the nations foremost rhetorician, Abraham Lincoln rose and made the following speech. But in a larger sense, we cannot dedicate, we cannot consecrate, we cannot hallow this ground. The brave men, living and dead who struggled here have consecrated it far above our poor power to add or detract. The world will little note nor long remember what we say here, but it can never forget what they did here. It is for us the living rather to be dedicated here to the unfinished work which they who fought here have thus far so nobly advanced. It is rather for us to be here dedicated to the great task remaining before us--that from these honored dead we take increased devotion to that cause for which they gave the last full measure of devotion--that we here highly resolve that these dead shall not have died in vain, that this nation under God shall have a new birth of freedom, and that government of the people, by the people, for the people shall not perish from the earth." The power of a monument is defined by its ability to continue to remain relevant long after it is created. In this respect the Lincoln Memorial seems as powerful today as it must have been long ago. Adjacent to the Lincoln Memorial is the Korean War Veterans Memorial. Dedicated in 1995, it recognises the efforts of men and women who fought and worked to protect South Korea from incursion from Communist North Korea between 1950-1953. Without television shows such as M*A*S*H the Korean war would be all but forgotten today, coming so close on the heels of World War II, and overshadowed by the later Vietnam conflict. However, the three years of the Korean war were very bloody, with 54,246 American casualties compared to 58,226 for the entire 16 years of the Vietnam war. The Memorial includes statues of troops, weighed down by their soaked ponchos, walking through fields, reflected in a stone wall, into which is inscribed the faces of some of the servicemen who fought in the battle. 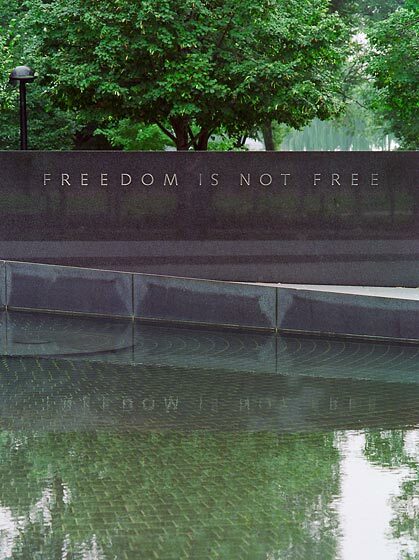 The memorial concludes with the pool of rememberance, where there is an incription which echoes across the country on every Rememberence Day - "Freedom is not Free". Hidden away near to the Korean War Veterans Memorial is a small, old memorial, so ignored that it does not even get a mention in the National Parks website. 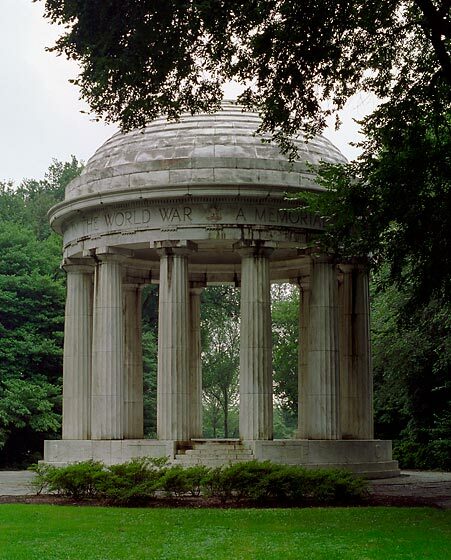 Hidden between two groves of trees stands the memorial to those servicemen who gave their lives in the World War. This is not World War II, but the First World War, originally known in most of the world as "The Great War", because no one could envisage any war that could exceed its horrors. As an Australian, the First World War has a particular place in our culture, because it was a defining event in the creation of our young nation. Over 330,000 Australians volunteered to fight in the war, and of that total, approximately 64% were casualties, with 59,000 killed and 152,000 injured. This equated to 10% of the men in the population, or virtually an entire generation of Australian men. As a result, the war spawned a huge number of memorials around the country, and these form the basis for our version of Rememberance Day, which we call ANZAC Day (ANZAC stands for Australia and New Zealand Army Corps). Even today, the ANZACs of the First World War are remembered in Australia. The USA, despite its late entry into the war, also paid dearly. A total of 4,272,500 men were called up, and of this amount approximately 117,000 were killed and 204,000 wounded. Despite this, the memorial today stands alone and not clearly marked. It even appears untended, and sadly has the appearance of falling into decay. Walking back from the Memorial to the Reflecting Pool one thing was immediately apparent. The Reflecting Pool was not reflecting! At the end of the reflecting pool furthest from the Lincoln Memorial the City is currently erecting a Memorial to those lost during the Second World War. 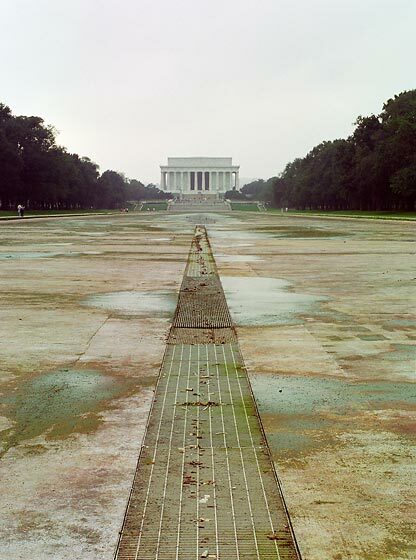 As a result, the pool has been drained, enabling me to obtain a very interesting look at the Lincoln Memorial. Further along the Mall you come to one of the most famous Washington DC sights, the Washington Monument. This monument was commenced in 1848 and completed over 40 years later in 1885. 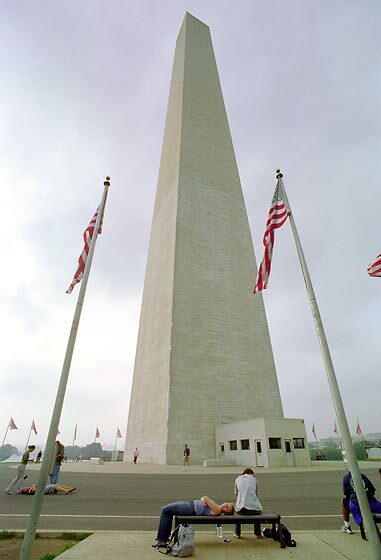 Over 555 feet high, it is a monument to a man recognised as the Father of the Country, George Washington. The monument was designed by Robert Mills, the first American born trained architect, after he won a privately organised competition in 1836. His design comprised a 600 foot square tower with a barely tapered top, rising from a huge greco-roman circular colonade, with 32 giant columns around the building. As can be seen the design was changed, but the core concept of an overwhelmingly striking and visible tower remained. The height of the tower is a reflection of the stature of George Washington in American History. Appointed head of the army of the newly formed "United Colonies of America" in 1775, he proceeded to wage war against the British until victory was finally achieved and the war declared over in 1783. In 1787, Washington was appointed the head of the Constitutional Convention that developed the American Constitution. Finally, at the first sitting of Congress and the Senate, George Washington was elected the first President of the United States of America in 1789. After an eight year presidency finishing in 1797, George Washington died in 1799, leaving a legacy that is impossible to understate. A seriously foreshortened Washington Monument. Having a 17mm can sure be fun! It was getting late in the day by now, and the overcast skies that had dogged me all day were now threatening rain. I decided it was about time that I left the city and headed back to Columbia Heights to meet Phil. After all, we had a treat in store tonight - we were going to the Baseball! I am a big fan of both baseball and football, and accordingly the chance to see a major league baseball game was not going to pass me by! 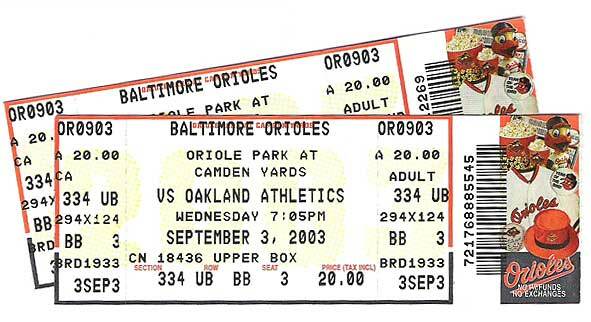 Phil and I headed out to Camden Yards to see the O's versus the A's in what promised to be a very one sided game with the Athletics playing very strongly and looking for a playoff berth, and the Orioles season effectively already over. Well it turned out to be completely different from our expectations. The O's scored 9 runs to nil in a shutout of the A's, and I saw a triple play, a couple of home runs, and all in all I had a fantastic time. 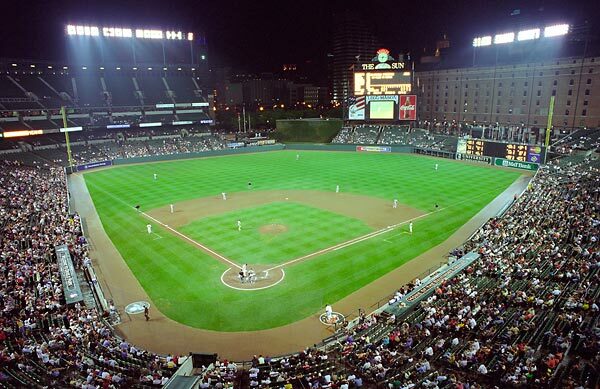 There is just something about going to the baseball that I love.